Lisa has worked on a range of projects including monitoring Tasmanian devils with devil facial tumor disease, understanding the impacts of wind farms on bats and determining the habitat requirements of possums and bats. Lisa’s main career focus, however, has been improving how we manage our forests for wildlife, in particular, bats. In her recent PhD studies at the University of Tasmania, Lisa has spent the last few years researching Tasmania’s bats to discover where they live, what they do and where they go in an effort to conserve bats and their habitat. We have a botanical cemetery over the back fence, so have a fair bit of wildlife around here.I have been trying to encourage more bats into the garden, especially the micros. I have a couple of solar wall lights to attract insects around my house, but I know there are only certain species of microbats that this encourages, and others give the light beams a wide berth. I rent, and am not able to put nesting boxes in our trees, so wondering what else I can do to try and encourage a wider range of the little fuzzies? It is great that you're encouraging bats into your garden, particularly as many species of bat can face food shortages when we have droughts or storms. You are quite right that some bats are sensitive to lights whilst others seem to be attracted to them because of the food supply they provide (insects). If you can, make sure some parts of your yard are unlit, that way more bats will enjoy the habitat your yard provides. Bats, like most animals, need food, water and shelter. If you cannot provide shelter (nest boxes) in your back yard then you should be able to provide food and water. Depending on where you are, you may have both fruit, blossom and insectivorous bats. You can provide food for bats by planting fruit trees or trees and shrubs that provide blossom (e.g. bananas, figs). You can also plant insect-attracting plants (for example Hakea). I recommend asking your local native plant nursery for advice on what is good in your area for attracting insects. Often insect-attracting plants have a beautiful night-time perfume so they would be quite lovely in the backyard. I would also recommend trying to get plants that flower at different times of the year as well, so bats have a food supply year round in your yard. You can also create a frog pond, which will can attract bats to either feed on insects or drink from the pond. All of these things can be temporary. You can use large pots for the plants and use plastic paddling pool for the frog pond. That way, if you ever move, you can take them with you. I hope his helps and that you have more bats coming to your backyard really soon. How do the bat colonies in Victoria compare to the ones in Tasmania? A great question that scientists are still investigating because it's actually quite complex. time of year ( e.g. are they breeding , have young been born or is it winter and most bats have migrated). No one has ever compared colony sizes between Tasmanian and Victorian bats. This is because in part because Tasmania only has micro-bats, a type of bat whose colony size is incredibly difficult to estimate. Victoria has both mega- and micro-bats. Mega-bats (flying foxes) are relatively easy to survey because unlike micro-bats they roost in the open on the outside of trees and are large. 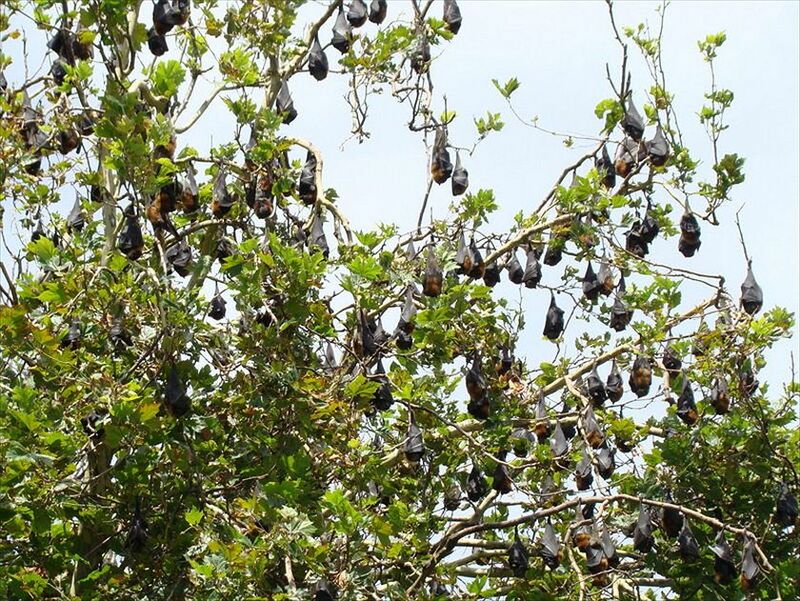 A great example of a mega-bat colony is the grey-headed flying fox colony at Yarra Bend in Melbourne. Scientists, including myself when I visit, go to Yarra Bend and count the bats as they roost and fly-out. This colony is estimated to be 30,000 individuals in summer to 3,000 in winter. However it gets more complex because mega-bat species such as black-headed flying foxes are expanding their distribution into Victoria. These individual black-headed flying foxes often don't form separate colonies but join with the grey-headed flying fox colonies. This makes estimated colonies sizes incredibly challenging! More info on Victorian bat colony sizes can be found on the Department of Environment and Primary Industries webpage. Micro-bats, especially those living in tree hollows, are incredibly difficult to survey because colonies move throughout the landscape every one to two days (the exception being cave dwelling micro-bats). Not only that, but recent scientific studies suggest micro-bats have complex social systems involving 'hub' trees, which are like a social centres for bats where an entire colony gathers, and other trees where you see sub-colonies gather and this changes nightly. What we do know though is that colony sizes of Tasmanian and Victorian micro-bats are similar, with females forming maternal colonies ranging in size from 20 up to 300 bats in tree hollows. This is quite small compared to New Zealand where the largest colony of tree-hollow using bats has been found to be 6,000 individuals! There may be colonies this big in Victoria or Tasmania, but we just haven't discovered them yet. Cave dwelling bats, which Tasmania doesn't have, are easier to survey and so we know more information about their colony sizes. For example, the southern bent-wing bat, which is a critically endangered bat, only breeds in two caves - one in south-Australia and one in Victoria. In Victoria, their cave roost is at Starlight Cave and previous colony size estimates have been ~10,000 individuals. However this colony has declined dramatically in size, as there used to be an estimated 200,000 individuals in this one breeding colony! This may sound big, but is quite small compared to the largest colony of bats in the world at Braken Cave, Texas which is home to over 25 million bats. You may be surprised to know that Victoria, particularly the city of Melbourne, didn't always have a permanent colony of flying-foxes. In fact the grey-headed flying-fox was once only an occasional visitor (vagrant) to Melbourne, but over the last decade it has now become a resident. Victoria also has another species of mega-bat, the black-headed flying fox, that over the last 80 years, has increased its distribution from QLD (1930) to Victoria (in 2010). Scientists are currently studying this phenomena as it may be related to changes in climate.